You can't go anywhere around Chengdu without running into pandas. There's a panda kicking a soccer ball, promoting ad space on a billboard. There's a panda sticker on the hood of a taxicab. The Pride brand of cigarettes has a panda on the carton. One of the five mascots for the upcoming Beijing Olympics (and arguably the cutest) is a panda named Jingjing. We'll be airing a story about the Chengdu panda base during our week of broadcasts in May, and last week I spent a day there. 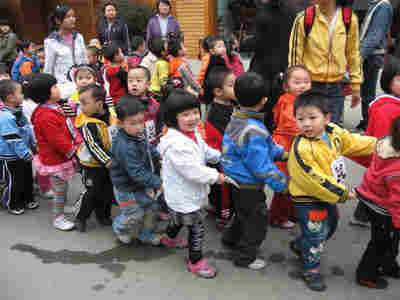 I visited right before the national holiday of Qingming, and the center was filled with throngs of children -- some of them as young as two. The children arrived on buses from their schools and were gleeful and LOUD, the older ones shouting out a ringing chorus of "hallooooo's "when they spotted us westerners. 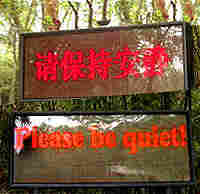 The center has signs up in both Chinese and English urging visitors to be quiet so the pandas won't be disturbed. But with many hundreds of children in the park on the day we visited, the pandas were surrounded by a sharp cacophony of voices. The innovative director of the center is Zhang Zhihe. Zhang is from a tiny village in the Sichuan mountains. He told me he was the only person from his district of 200,000 people to go to college, and he went on to get his masters in veterinary medicine at Sichuan Agricultural University. The fact that he made it from grinding rural poverty to the top job at this prestigious center is a testament both to his own talent and determination, and also to a huge generational change in China over the past thirty years: far broader access to education. You can tell by its name that the breeding center focuses largely on just that: producing more pandas. With giant pandas so highly endangered, the center is trying to boost the numbers to ensure a more stable captive population. Ideally, future generations of pandas will be able to be released into the wild. Last year, the pandas at the Chengdu base produced a bumper crop of cubs: ten babies, eight of whom survived. They're now weaned from their mothers and are bottle-fed. 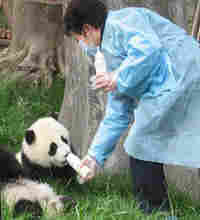 In late afternoon, as I was talking with Zhang Zhihe by their outdoor enclosure, there was a bustle of activity: it was feeding time. Keepers rushed around the grassy enclosure in blue gowns and masks, calling the cubs to come for their bottles. The pandas rushed and clambered over their wooden climbing structures, grabbed the bottles with their front paws, lay down on their backs, and got right down to business. I also learned a new word at the panda center: neotenic. The director of animal health there -- Kati Loeffler -- told me it refers to animals that retain baby-like features: in the case of the giant panda, that round face and body, those soulful black eye patches. In other words, they're irresistably cute.